We are the Indian manufacturers and exporters of promotional gifts and customized odd items. We have wooden joinery mills to undertake finished wooden products as per your requirements. 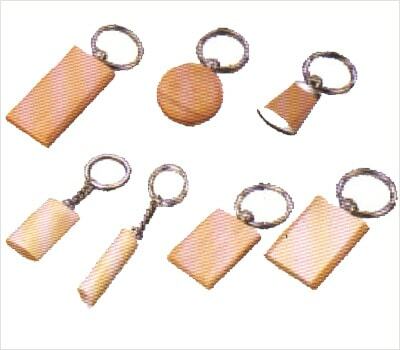 We deal in a high performing range of Wooden Key Chain. Our product range also encompasses of Designer Wooden Key chain. Manufactured using innovative methods, these products have high utility as they are designed using superior quality wood and other basic components. These products are flawless as they go through strict quality check process, before delivering it to the customer's end. Precisely designed and safely packed, these products are known for aesthetic appeal and elegance. Wooden promotional table top gifts for CEO’s, executives and managers. Smartly designed table tops with pen holders, mobile holders, watches & visiting card holder. Providing you the best range of Wooden Pen such as Wooden Roller Pen, Roller Pen and Wooden Pen Box with effective & timely delivery. Backed by rich industry experience and knowledge, we are involved in bringing forth for our clients an exotic assortment of Wooden Desktop Calendar. 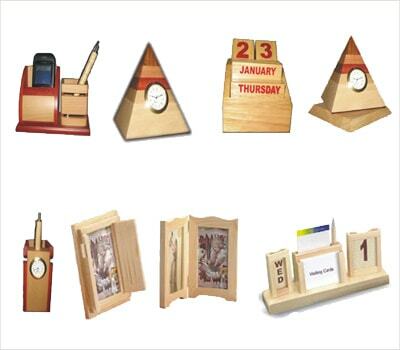 Our product range also includes Desktop Calendar with Watch, Wooden Desktop Calendar with Mobile Stand and Desktop Calendar. Being one of the neediest article of our regular life, these desktop calendars, are widely used homes or corporate sectors to hang on walls on placed on desks. Apart from this, these can also be placed on the top of a refrigerator, middle shelf of a book-stand, on bed-side table, on the show racks of house or office. Further, owing to the features like compact size, light weight, smooth & perfect polish, these products are highly applauded in the market. We offer an elegant range of Wooden Desktop Items, which are uniquely designed in interesting patterns. We provide our clients with customized solutions to ensure its hassle free and efficient performance. These wooden decorative items can provide an appealing look to your table as well as other desktops. Our range of products include wooden desktop watch such as Desktop Watch with Pen and Wooden Desktop Watch with Pen. We are leading Supplier & Manufacturer of Wooden Name Plate. Developed and designed using high quality wood, these calendars are attractive as a show piece and as well as have longer functional life. In addition to this, customers can avail these wooden desktop items from us at competitive prices. We are a reputed organization engaged in manufacturing, supplying and exporting a broad series of Wooden Mobile Stand. Being one of the neediest article of our regular life, these stands are widely used homes or corporate sectors to keep the mobile phone as it prevent scratches. Apart from this, these can also be placed on the top of a refrigerator, middle shelf of a book-stand, on bed-side table, on the show racks of house or office. We are counted among the leading entities engaged in manufacturing and supplying an exclusive range of Wooden Pen Stand. Our product range also include Wooden Pen Stand with Watch, Desktop Pen Stand with Watch, Designer Wooden Pen Stand. These products are manufactured using high quality wood and other basic raw material under the supervision of our professionals. Further, these products are hygienically and safely packed, before delivering it to the customers end. These products are known for optimum strength and smooth finish. 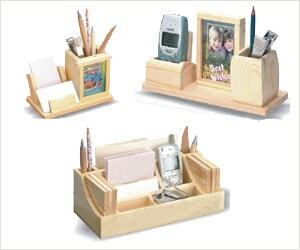 Our domain expertise has enabled us to come up with an excellent collection of Wooden Desktop Organizer. This offered range of the products is widely known for its high durability, smooth finish, finest texture paper and attractive designs. Furthermore, to cope up with the variegated demands of our patrons we offer this range of the products in varied sizes, shapes and also in custom-built designs.